建立成員國秉持民主與非干涉的願望，希望能找到委內瑞拉危機和平解決的方法。Establishes member states and outlines the democratic and noninterventional ambitions of the group to find a peaceful solution to the crisis in Venezuela. 標誌利馬集團的定位與在委內瑞拉危機中的目標 Highlights the positions and goals of the Lima Group regarding the crisis in Bolivarian Venezuela. 譴責委內瑞拉民主秩序的崩潰Their condemnation of the breakdown of democratic order in Venezuela. 基於制憲大會的非法本質，利馬集團決定不承認制憲大會及其作為。，Their decision not to recognize the National Constituent Assembly, nor the acts emanating from it, due to its illegitimate nature. '利馬集團完全支持民主選出的全國代表大會。Their full support and solidarity with the National Assembly, democratically elected. 根據憲法的合法行動需要來自Legal acts that according to the Constitution require authorization from the National Assembly, will only be recognized when said Assembly has approved them. ^ Grupo de Lima | América Latina. Deutsche Welle. 14 November 2017 [15 February 2018] （西班牙语）. ^ Declaration of Lima. Government of Peru. [15 February 2018] （欧洲西班牙语）. ^ Regional neighbors call on Venezuela to cancel election. Washington Post. 2018-05-14 [2018-05-15]. ISSN 0190-8286 （美国英语）. ^ Regional 'Lima Group' leaders urge Venezuela to suspend election. Reuters. [2018-05-15] （美国英语）. ^ Los 14 países del Grupo de Lima llaman a consultas a sus embajadores en Caracas. [2018-05-21] （欧洲西班牙语）. 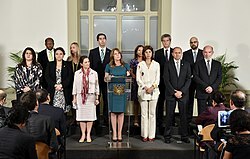 ^ Lima Group recalls Venezuela ambassadors, condemns vote. 21 May 2018 [21 May 2018] （英语）. ^ Perú convoca al Grupo de Lima para analizar elecciones en Venezuela. El Nacional. 8 February 2018 [15 February 2018] （西班牙语）. ^ Cancilleres firmaron la Declaración de Lima - Caretas. Caretas. 3 August 2017 [15 February 2018]. ^ Grupo de Lima respalda a Panamá tras sanciones de Venezuela en su contra. [2018-04-07] （欧洲西班牙语）.